free recoil velocity. Furthermore, the bolt return time will have a significant effect on the rate of fire under practical conditions. Therefore, the maximum attainable rate of fire will be considerably lower than 675 rounds per minute and the best that can be expected is in the neighborhood of 300 to 500 rounds per minute. In modern terms, this is considered a prohibitively low cyclic rate for any 20-mm machine gun. 1. To obtain a high initial recoil velocity, the recoiling parts must be made as light as possible consistent with the practical requirements for strength, rigidity, and durability. 2. The recoil distance should be no greater than the minimum necessary to provide an adequate opening for feeding, as governed by the overall length of the incoming round. 3. The gun mechanism should be arranged to minimize delays by taking advantage of every possible instant of time (rapid unlocking, eject at instant extraction is completed, etc.). 4. in smaller caliber guns, instead of using the barrel spring to absorb most of the recoil energy, this spring could be made as light as possible and be depended upon only to hold the barrel in battery. This would produce a condition of low retardation, thus permitting the barrel and bolt to recoil the entire distance with little decrease in velocity. The reversal of their motion at the end of recoil could then be accomplished by causing the recoiling parts to rebound from an extremely stiff buffer spring. Although this arrangement gives a high average velocity of recoil, it should be noted that the reversing action of the buffer spring will be rather violent, and accompanied by high impact forces. In addition, the impact loss in the buffer may be considerable with the result that the slowness of the long counter-recoil movement of the barrel would reduce or eliminate entirely any advantage gained during recoil. Since the advantage of employing this method is doubtful in a long-rccoil gun, the use of a con ventional barrel spring will be assumed from this point forward. on the muzzle face of the barrel and thus increases the recoil velocity. All of the preceding points are concerned with the problem of obtaining the optimum rate of fire from the long recoil system as applied to a smaller caliber gun, but as has been remarked previously, even with these refinements, the cyclic rate will still be relatively low. 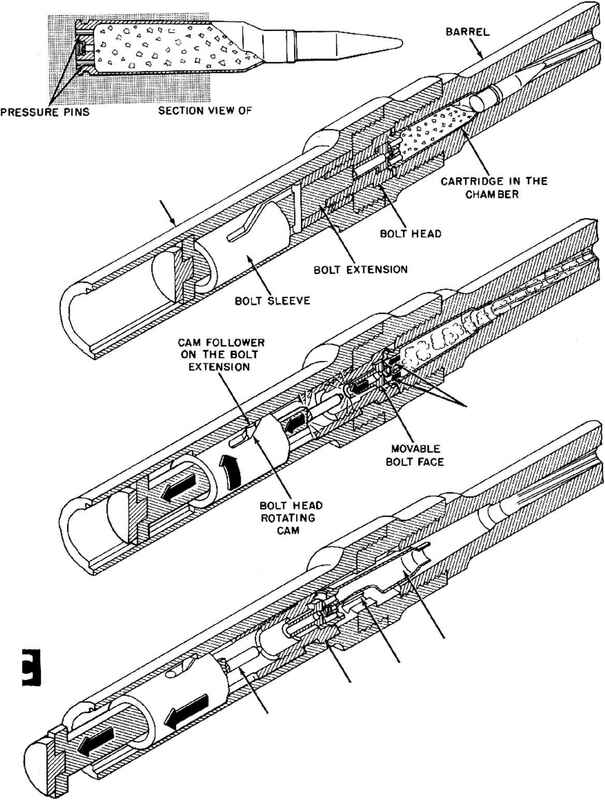 This limitation, coupled with the design disadvantages arising from the long travel of the heavy barrel and from the inherent complexity of the mechanism, probably accounts for the fact that no successful machine gun using the long recoil system has appeared among modern weapons of 20-mm or smaller caliber.